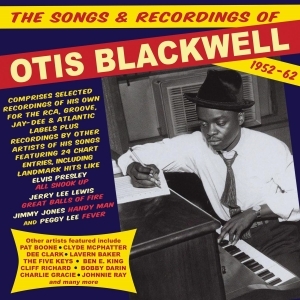 Otis Blackwell was one of those unsung but highly significant behind-the-scenes figures who played an important role in the careers of some major rock ‘n’ roll artists as well as influencing the direction that popular music took during those dynamic formative years. He was initially an R&B singer and songwriter in the early 1950s, making the classic record “Daddy Rolling Stone”, but found his metier as a brilliantly innovative songwriter whose work was recorded by artists across the pop spectrum, his big hit songs including “All Shook Up”, “Don't Be Cruel”, “Paralyzed” and “Return To Sender” for Elvis Presley, “Great Balls of Fire” and “Breathless” for Jerry Lee Lewis, “Handy Man” for Jimmy Jones and “Fever” for Peggy Lee, among many others. This great-value 62-track 2-CD set provides a fascinating cross-section of his career, comprising selected recordings under his own name for the RCA, Groove, Jay-Dee & Atlantic labels, plus recordings by other artists of his songs featuring 24 chart entries, including those mentioned above. Among the artists included are Pat Boone, Clyde McPhatter, Dee Clark, Lavern Baker, The Five Keys, Ben E. King, Cliff Richard, Bobby Darin, Charlie Gracie and Johnnie Ray, as well as an early incarnation of The Four Seasons as The Four Lovers. It offers an enlightening and entertaining insight into the work of a hugely talented pop practitioner who has not received the attention which his music deserves.